After spending many years studying the way of the sword, Rolf returns to Paseo in his late teens. 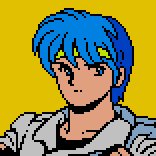 He is easily recognizable as the future hero of Phantasy Star II here, but still has some growing to do before he can fill that role. Shortly after returning to Paseo from Uzo Island, this young man will find himself caught up in a web of deceit that must be unraveled if his destiny is to be discovered.